Ah... where to start, I would like to think I could sit down and write a long elegant meaningful post introducing you to the new chapter in our lives, but I think I'll just write what's on my heart. Some of you who know me know that I was adopted. I always felt I would be the mom to an adopted child. Many times Dane and I would talk about adding to our family by adoption but the time never seemed right. So life sped on by as it always will and we got busy living life on a farm with 9 wonderful blessings. Then God asked us something, "What are you doing for the least of these?" Um...Ah...You mean orphans and widows and those least of these? Our answer was, unfortunately, nothing. We were busy living our lives making us happy, preferring not to see the agony and neglect of "the least of these". Well, to make a long story short, the Lord showed us that we were to redeem the life of one of the least. He called us to adopt! Yep, we're still kind of reeling ourselves!! The peace that comes from being in the will of God is the best place to be though. Time and again God has given us confirmation that this is His will and His direction! So without further adieu may I introduce you to Miss Morgan. She will be 2 in May and she is currently living in an orphanage in Eastern Europe. She has Down Syndrome, and we are very excited about bringing her into our family. She'll nestle in just right between Octavian and Aliviah! We are starting the mountains of paperwork, and trying to get our house in order for the home study! This experience will be nothing short of miraculous and we are very exited to watch God work on Morgans behalf! International adoption is not easy or cheap! From beginning to end it will be about $25,000! Now, like most of you, we don't have money like that just sitting around!! When we prayed and asked God about the financial aspect of this adoption, we felt our answer was simply, "Trust". So we are trusting God for His provision for our adoption! We are continuing to put one foot in front of the other and are excited to watch our Heavenly Father work out the details!! 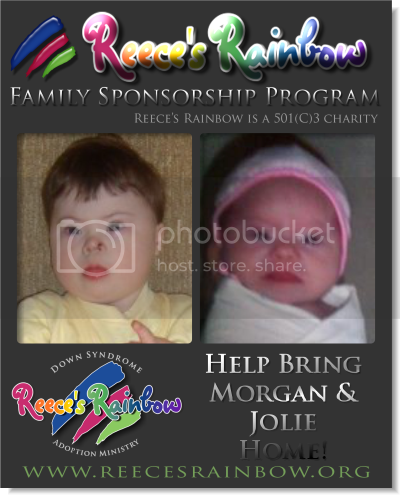 We do have a Family Sponsorship page set up on Reece's Rainbow, if you feel led to give to Morgans adoption and help bring her home we would be so grateful. It hurts our hearts to think of her way over there without a Mama or Daddy to comfort her, love her and hold her, the sooner we can get there and make her ours the better. We would also covet your prayer and will do our best to update our little adoption blog frequently. If you have any questions please ask. Thank you and may God bless you! So happy, so very happy! May she come home soon!! And God will lead you every step of that way. Congrats! I adore Morgan (also the name of my oldest child!) I'm excited to follow along! We're a fellow RR adoptive family who is also from NEMO! So great to hear of others stepping out in this leap of faith. She is a precious little girl. Congratulations! Morgan reminds me of our little Ally whom we adopted from Bulgaria. So cute! I pray that your adoption process goes smoothly. You all are a special family, Morgan is blessed to have you and I know you all will be blessed with her. Hope I get to meet her soon. I saw your story on the Reece's Rainbow website, and decided that a fundraiser I was doing would be specifically for you. It's a Pampered Chef show, and all proceeds will go to help you with Morgan's adoption. Anyone can buy for the show and have it count for you. They just need to go to www.pamperedchef.biz/meganhemphill and enter Raylene for the host name. Then 10-15% of their order will go to you. Feel free to let all of your friends know! Orders can be placed through March 27th. We have five children, our oldest we adopted through foster care, the rest are biological born, our youngest who is now 6, has Down Syndrome. He is a blessing, he is the light of our eyes, we marvel at what we could have done so right that God would bless us with him. praying for Gods blessings on you.